If you remember the 80s then you probably remember the days when dogs didn’t have much choice about where to sleep. They could sleep on your bed, on some well-used blankets, in a basket or make do with nothing at all. Boy, have things changed. We look at all the deluxe options now involved in choosing dog beds. Now dogs have more variety when it comes to their sleeping arrangements than people do. There are virtually no end to the types of dog beds available, and they’re not just for cute effect, instead many dog beds have been designed for specific purposes; for example, camping with the family or easing arthritis and joint pain in older dogs. All of this means that buying a dog bed is no longer a simple process of popping down to the pet store and picking the cheapest or prettiest one there. Your dog’s age: Old dogs need beds with more support, so soft cushions and super-plushy beds are out. Puppies can be chewers, which makes non-chewable dog beds or beds made with very durable material are better than something too cutesy with accessories. Your dog’s size: large breed dogs need beds with more support than small or medium dog breeds. Small dogs may prefer cozy beds in which they can snuggle for extra warmth. The way in which your dog sleeps: Dogs that like to curl up may prefer beds that have sides that they can curl up against. Dogs that like to stretch out on their sides or tummies may prefer cushions or pillows that give them plenty of room. What makes a good dog bed? Think about what you love about your bed: Is it spacious, is it soft (or nice and firm), does it make you feel comfortable – as if life’s troubles can’t reach you there? Dogs need all of that from their beds too. They need a place that will protect them from the cold and that may also keep them cool on a hot summer’s day, they need support for their bones and joints, they need comfort and they need to feel secure. A dog’s bed should be a safe place where they aren’t disturbed by children or other household traffic, where they can rest after play and where the world can’t hurt them – and they can’t hurt themselves. Cleanliness: Is the bed easy to clean? Is the dog bed machine washable? Does it have removable covers? Will it collect hair and dander and retain odors? Protection for outside dogs: Outside dogs need extra protection from the cold and other weather conditions. Type of filling: Is the filling made from quality materials that won’t clump, lose shape and aggravate pain? Memory foam is a good choice. Some dog beds use a combination of foam and polyfill, which is fine, but if you have a dog with special needs you should make sure that both are of a high quality. The range of pet beds is incredible, with all styles, colors, shapes, textures and materials available. There are a few accepted dog bed types, though, which we’ll look at below. Orthopedic dog (and cat) beds are specially designed to give dogs with any kind of joint or skeletal pain relief and support. They are ideal for older dogs, overweight dogs, very large dogs and young dogs with degenerative conditions like hip dysplasia and spondylosis. They are usually large and flat and should ‘push back’ rather than ‘sink in’ so that dogs can spread out and distribute their weight evenly over their sore bodies. Memory foam is usually the best material for orthopedic beds, but it tends to retain odors, so it might not be the best filling for an old dog who is becoming incontinent. You can get a waterproof cover, however, which will protect the memory foam. Top-rated orthopedic dog beds include Plush Memory Sleeper, Snoozer Orthopedic Cozy Cave Pet Bed, Ortho Small Dog Sleeper, Snoozer Memory Foam Luxury Pet Sofa, Go Pet Club Orthopedic Bed and Kirkland Signature Pillow Top Orthopedic Pet Napper. You might also want to try these top-rated beds available from Amazon: Happy Hounds Oscar Orthopedic Dog Bed, K&H Deluxe Round Ortho Bolster bed, Big Barker and Brindle Memory Foam Mattress. Donut (bolster) dog beds are well-cushioned with raised sides, so that dogs can curl up for a sense of security or support. The sides add to warmth on cold nights by retaining body heat. This makes them good for small dogs, short-haired dogs and underweight or naturally thin dogs. Size is important when choosing a round bed like this because if you buy one too big your dog could feel insecure, while a bed that’s too small doesn’t allow your dog to shift comfortably. It’s important to check the stuffing in the cushions as some materials are toxic to dogs, some clump uncomfortably and some are less breathable than others. Top-rated donut or nest dog beds include Pioneer Pet Oval Cuddler Bed for Cats & Dogs, Heated Bolster Dog Bed, Bowsers Bolster Dog Bed, Bowsers Donut Dog Bed and Big Shrimpy Nest Faux Suede dog bed. Pillow or cushion dog beds are nearly as simple as beds get. They are straightforward rectangular or round beds that come in different sizes and often have removable covers for easy cleaning. Memory foam is one of the best materials used in standard dog beds. Top-rated cushion dog beds include Bowsers Luxury Round Dog Bed, Snoozer Overstuffed Luxury Pet Sofa, Kong Lounger do beds and Kong Heavy Duty Pillow Beds. Heated dog beds help senior dogs, dogs with pain issues and dogs who feel the cold easily. Another option is heating inserts that you can put in your dog’s bed to ease pain and eliminate cold. Removable pads and microwave bean bags will also work. You can also get beds specifically for outdoors, such as the Lectro-Soft Outdoor Heated Bed. Top-rated heated beds include Orvis Heated Memory Foam dog bed, Wellness Petsafe Heated Sleeper, Dolce Vita Heated pet bed, Heated Orthopedic dog bed and Thermo Napper Heated pet bed. 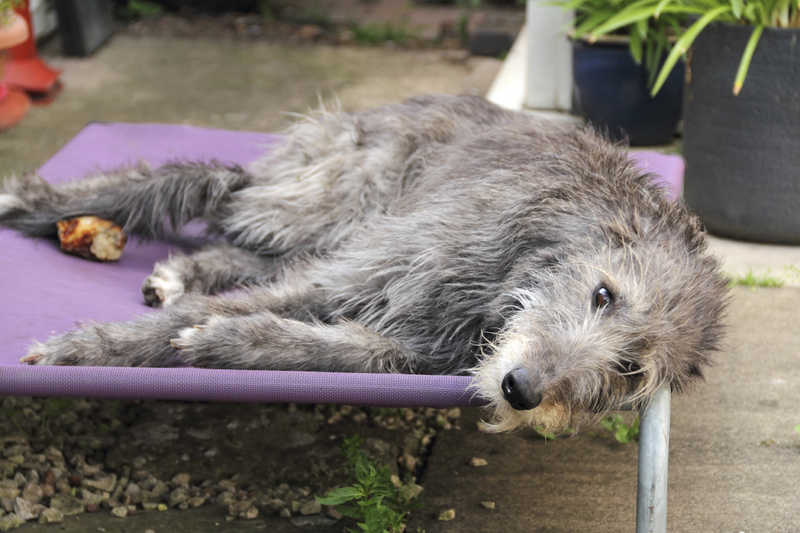 Pet cots or hammocks are great beds for outdoor dogs. They are easy to move, so you can shift them from the sun to the shade as the weather dictates. Cots are also great indoors as they can be covered with a mat for extra warmth and insulation or simply left bare with cool air circulating underneath. They are also easy to clean; simply hose them off. Finally, they’re great for big dogs because they don’t have to lower themselves onto them or heave themselves up. They’re also great for long-haired dogs because of the cooling factor. Top-rated cot dog beds include Coolaroo Elevated Pet Bed and Kuranda orthopaedic and chew-proof dog beds. Covered dog beds are great for small dogs who like to snuggle, or anxious dogs who need a sense of security. They come in a range of designs, from simple igloo beds to beds shaped like houses (with chimneys) and tents. Some dog beds are entirely cushioned, usually with removable covers for easy washing. Others have a sturdier base, like wicker or plastic baskets, with a cushioned cover. Big dogs don’t always like covered beds because they feel too confined, but that doesn’t mean your Great Dane won’t try to squeeze into your Yorkie’s igloo. Car dog beds or dog car seats are designed to keep your dog safe and comfy while travelling by road. Some car beds are very simple – bolster beds that fit on a car seat or in trunk space. Pet hammocks hang between the front and back seats and protect seats from dirt and hair. There are the fancy dog car beds that look like cushioned boxes, with accessories, including storage trays and travel racks for food and water. Top-rated dog car beds include Snoozer Luxury Lookout, Snoozer Console Dog car seat (for small dogs), Skybox Pet Booster seat, Snuggle Bug pet carrier and K&H Bucket Booster pet seat. 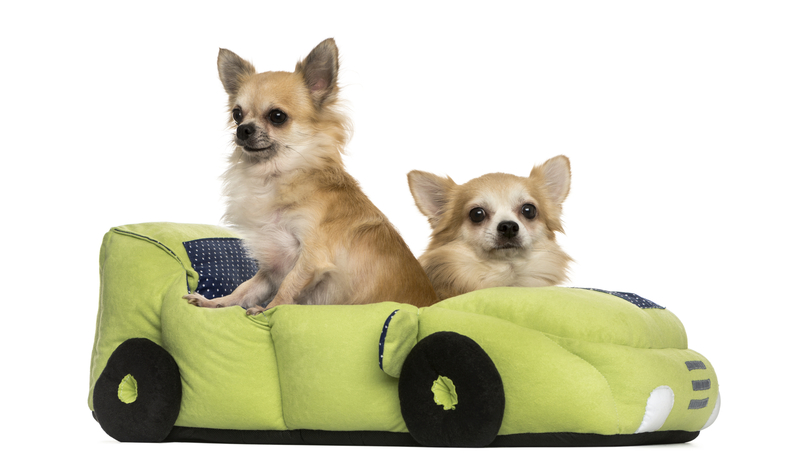 Then there are car-shaped dog beds for serious car enthusiasts. Amazon sells ColourfulHouse Deluxe Cute Cozy Car Pet Beds for small – medium dogs, Dog Diggin Designers Ferrari Furarri Car dog bed, Kisspet Luxury Cool Sports Car Design pet bed house with removable pet bed mat and Huhushop Luxury Sports car designe pet bed for small dogs. Cedar dog beds, which are used for odor control. There are some downsides to cedar dog beds. Not all dogs like the smell, some dogs are allergic to cedar and cedar fillings aren’t as soft or comfortable as other mattresses. Eco-friendly and organic dog beds are ideal for those who practice green living. Eco-friendly beds are usually made from recycled and recyclable material. 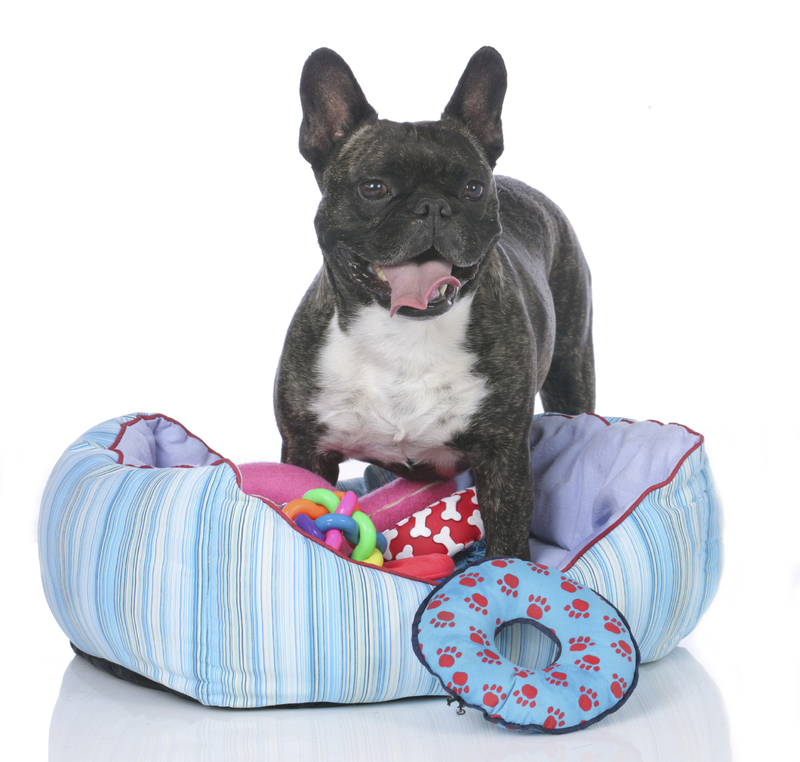 Organic dog beds are made from all-natural materials, such as cotton, eco-fleece and all natural rubber. Fabrics are also usually natural and chemical-free. Hypoallergenic dog bed covers tend to be waterproof, chemical-free and resistant to dust, mites and fleas. They are also easy to clean and come in a range of sizes. Corner dog beds are great space savers and can give anxious or nervous dogs a sense of security with only one open side. Crates are also good to ease anxiety, provided you do proper crate training. 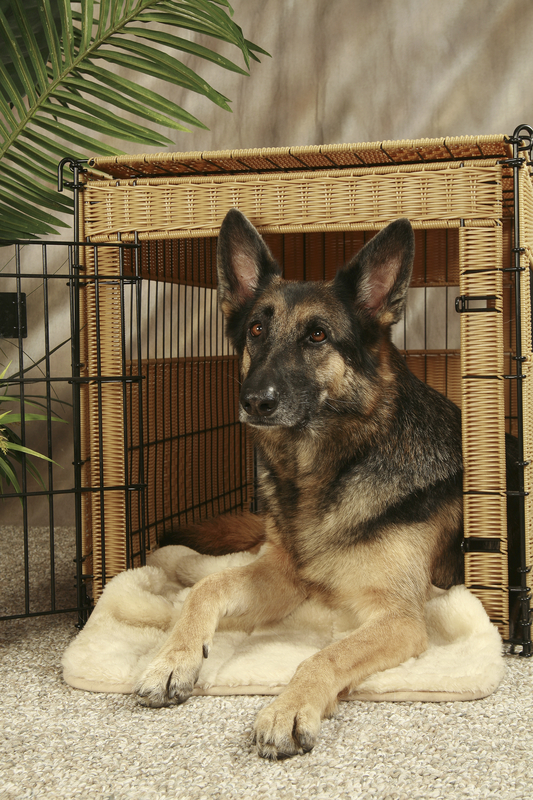 You can get special crate mats or dog beds to fit different sized crates and kennels. You can choose between wire crates and covered crates, which some with an extra sense of security built in. Many covered dog crates come with a mattress, usually fleece or a durable, weather-proof mat you can remove and hose down. Cooling dog beds are ideal for dogs who are very sensitive to heat, especially longhaired dogs and brachyecephalic dogs. Brachyecephalic dogs have truncated snouts and include bull dogs, Boston terriers and pugs. Many large breed dogs also need help staying cool in summer, especially if they are carrying a little extra weight, so your Labrador and English Mastiff and Doberman may appreciate a cooling bed. Some cooling beds have removable gel pads, which you can freeze individually. Top-rated cooling dog beds include Canine Cooler Thermoregulating dog bed. Travel dog beds are portable so you can pack and up and go anywhere with your dog. They roll up into bundles and may come with a carrier bag so you don’t have to juggle an unraveling bed. Some dog bed manufacturers make custom dog beds, so you can design a bed or personalize the cover. Many people who opt for these kinds of designer dog beds usually use pictures of their dogs as the template. Extra small: 16 x 21 rectangular. 30 – 36 round. For dogs who weigh less than 20 pounds; for example, Yorkie, Maltese, Pomeranian and all miniature and toy breeds. Small: 18 x 23 rectangular. 30 – 36 round. For dogs who weigh 20 – 25 pounds; for example, Boston terrier, Dachshund, Shetland sheepdog and Pug. Medium: 21 x 28 rectangular. 36 – 45 round. For dogs who weigh 25 – 40 pounds; for example, Beagle, Cocker spaniel, Springer spaniel and French bulldog. Large: 24 x 36 rectangular. 45 – 52 round. For dogs who weigh 45 – 70 pounds; for example, Basset hound, retrievers, collies, Irish setter, husky and standard poodle. Extra large: 28 x 43 rectangular. 45 – 52 round. For dogs who weigh over 70 pounds; for example, Malamute, Mastiff, German Shepherd, Great Dane, Irish Wolfhound, Mastiff, Weimeraner and St. Bernard. Many people sheepishly tell trainers that they know it’s wrong but their dog sleeps on their bed with therm. There is nothing wrong with your dog sleeping on your bed if that’s what you want your dog to do. You may lose out on sleep as your pooch takes over the entire bed, but if you’re ok with that, then go for it. The only thing you have to consider is how easy it is for your dog to get on your bed. Small dogs, puppies, long-backed dogs (bassets) and old dogs can hurt themselves jumping on and off a medium-high bed. Consider getting some pet steps so your dog can get on your bed easily. Bear in mind that you may have to do some step-training to get them used to stairs. An orthopedic bed which offers support for his legs would probably be your best bet. Is he an outside or inside dog? Having him sleep inside would also be better for his bones in the long-term, as he won’t be exposed to inclement weather.